It's all over, folks. After four days, 90-some-odd acts, and persistent exposure to just about every frequency on the sound spectrum audible to human ears, the Neon Marshmallow Festival departs the Viaduct Theatre, leavings the concertgoers fatigued, overstimulated, and slightly depressed about the prospect of returning to the real world, where things seldom get louder than a tepid hum. In the time it took me to recap the day before, I missed much of the early afternoon's festivities, including what many later told me was a weekend-defining set by Instinct Control, as well as the point where Fatale blew the tweeters on the main room amps. Mea culpa, but mea was exhausta, and needed mea beauty rest. I got in around 5:15, just in time to hear a loud, high-speed barrage of ugly harshness which I recognized as Chicagoan Jason Soliday. Soliday's rig now includes a Sidrassi Organ, which allows the user considerable freedom to pitch-bend and dirty-up any source sounds traveling through it. 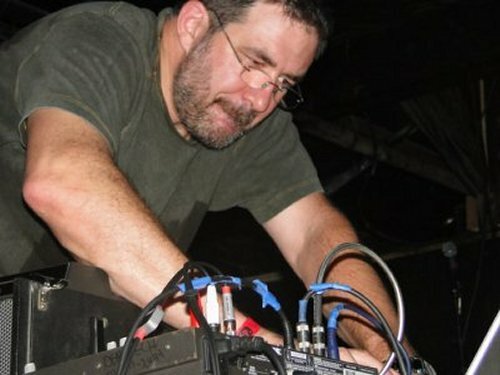 Soliday used his combo to smash together a pastiche of noise styles, first combining a high-speed cutup sound with much blockier, less overtly "noise" frequencies, like digital boulders tumbling into an electrified gravel pit, then settling into a five minute swelling drone before jumping back into the cantankerous whorl. The control exhibited throughout, as well as a clear vision for the sounds being generated was pretty exciting, and the crowd let him know it. The set by Jason Crumer (California) was engulfed in controversy — if you don't know about it, I'll spare you the details — but the long and short is that the set was a little underwhelming. Crumer looked visibly nervous onstage, expecting some sort of outburst from the audience. He go no such, but the set itself was clearly influenced by the electric possibility that punches would be thrown. Those of us who have been fan's of Crumer's records were left explaining to newcomers that you still have GOT to check out Ottoman Black (to name just one example) to get the full picture. Burial Hex (from Madison) was a little quiet to my ears, but that may have been the blown tweeters from earlier in the day. Clay Ruby's pitch-black industrial project built up to a powerful final act, reverberating sounds like gunshots punctuating the fetid mood. 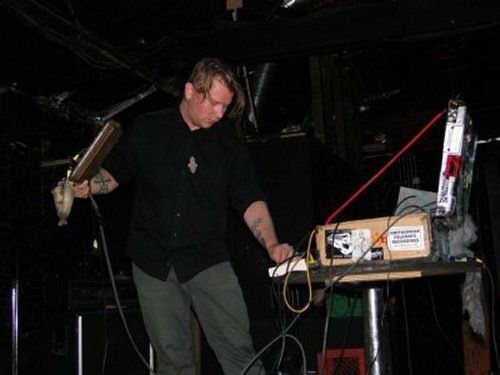 Like Rochester, NY's Pengo and Oakland's Sixes, I've always thought of Burial Hex as having something of a Hell's Angels vibe about it, a sound with a thin layer of motor oil and rough knuckles built in. This set was good, but his set at Matchitehew Assembly last year was even better. Piss Piss Piss Moan Moan Moan (Chicago) brought the old adage (from Eddie Flowers) to life: "rhythm + sound = music." It's so easy, I'm surprised fewer people acted on it! Alejandro played fast, sloppy, but danceable drums, while Nicole made her theremin and electronics swoop and sweep in time. Once you get down to these basics, anything's possible. Ducktails gets the award for most New Wave of the night, his repetitive keyboard melodies and ringing guitar lines making the people waiting to dance (and experience 'good vibes') bounce around. Stood out in the night's lineup like a penguin in a dog pound. Ohio's Ryan Jewell was the highlight of the night for me, and a surprise one at that -- my first impression as the set started was "does he know there's no sound coming out," which turned to annoyance, and then fascination. Jewell used a snare drum as his primary resonator (genius idea, that), placing various items on top of it and using the drum's natural tendency to amplify vibrations to created all manner of textures. This included styrofoam, cymbals, and a steel (?) rod that vibrated anything it touches when rubbed. The sounds ranged from small/imperceptible to overly grating/repetitive for a while, Jewell trying each combination and then nodding to himself after it was done, like an OCD patient checking off in his mind the small rituals that need to be done (IN ORDER, of course) so that he doesn't fall down an open elevator shaft. After a long time, Jewell started turning on some of the tape recorders that seemed to be sitting silent all this time, only to reveal that every time sound he was making, whether we could hear it in the air, had imprinted itself onto magnetic tape (or digital storing banks) and was now available for manipulations. A thick mass of abraded sounds tied the second half to the first, and my initial annoyance turned to unbridled enthusiasm. 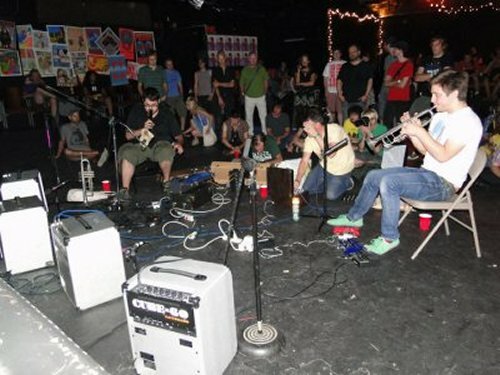 Ryan Jewell created bracing sound out of private ritual. Impressive, and sounded great to boot. Keith Fullerton Whitman certainly was the MVP of the weekend; just as Dominick Fernow of Prurient seems to mix well with anything at the No Fun Festival, so was Whitman called upon for a variety of tasks, from his two excellent solo performances to collaborations with Caboladies and, now, Chicago's TV Pow. The group, including three core members and Whitman, was one of the better TV Pow sets I've seen, a paranoid urban back-alley fever dream with low-pitched electrical tower hum, static crackles, snippets of voice coming through like police-band radio, and an overall atmosphere of surveillance. Like life, it was nasty, brutish, and medium in length. California's Pod Blotz, one Suzy Poling, used to live right here in our fair city before the gold prospector's call caused her to go west to San Francisco. 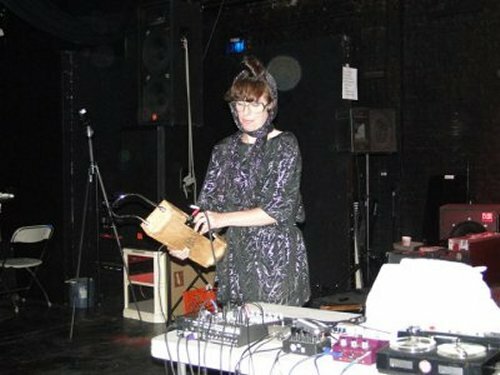 Her set at the time was heavily theatrical, involved all manner of costumes and facaded electronic displays, and strange, alien gestures and vocal processing. Tonight's show was a little more laid back and open, but still pretty strange. She started by asking the seated balcony-occupiers to do the wave, but soon serenaded us with an invocation for baritone theremin. Seriously, it was so big, she was able to cradle it in her arms like a baby! 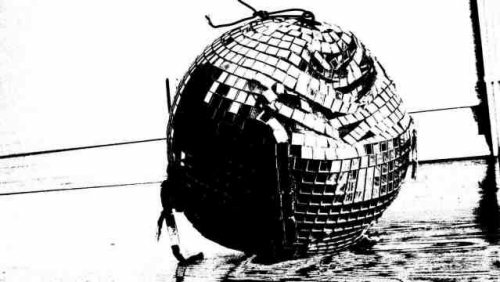 She chanted, sang, and recited monologues in robotic monotones, made a spotlight around the room with a hand mirror and flashlight, and darkened the tone of the room with some fearsome, Forbidden Planet-style electronic lunar walks. Her trademark organ-driven sound of yore was a little missed, but her new, sleeker arsenal (perhaps pared down specifically for travel purposes) hit the spot nicely. 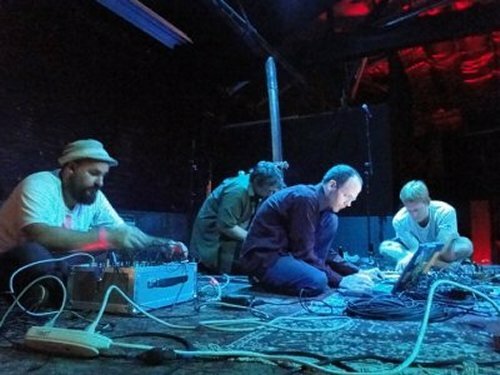 Rating Justice Yeldham and the Dynanic Ribbon Device (Australia) against other Neon Marshmallow acts seems unfair. Like Dave Phillips (with whom he toured extensively in 2005), his work is utterly singular, based in a personal vision, and has been uncopied in the world. His work is on another level; comparing it to other acts doesn't make much sense, any more than you'd compare a boxer with a mixed martial-arts fighter. They're each great at what they do, but not strictly the same thing. Like Justice Yeldham, they both do get bloody. 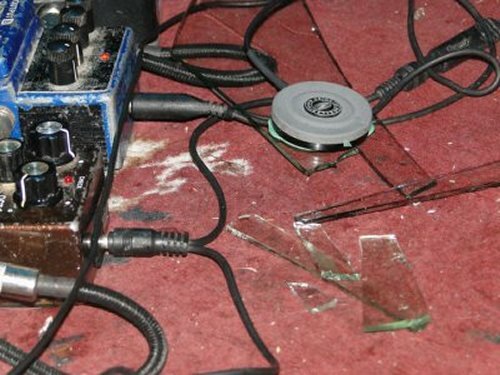 Lucas Abela (the Justice himself) takes a pane of glass, slaps on contact mic attached to some pedals on it, lubes it up, and slams his face against it, using the glass's resonance powers to amplify the sounds of his voice, the varations caused by pressing against it with his fingers, and the rich palette of effect-driven modifications to both. Tonight's version was a bit longer than many I've seen (maybe trying to use as much of the 20 minute allotment as possible), paused several time for drink breaks (first I've seen), and had more anthemic "singing" than I've seen before. I've seen the Justice do this in person at least five times, and many more on the internet and on his Cicatrix CD/CD-ROM, so after a while, the fun of watching is partly watching others experience it for the first time. Interest fades a bit as the glass singing goes on, but the moment he bites down on the glass and breaks off some of it IN HIS MOUTH, the crowd goes into a mad frenzy! By the time the last piece is smashed on his head, the crowd is braying likes wolves. Never seen it fail. 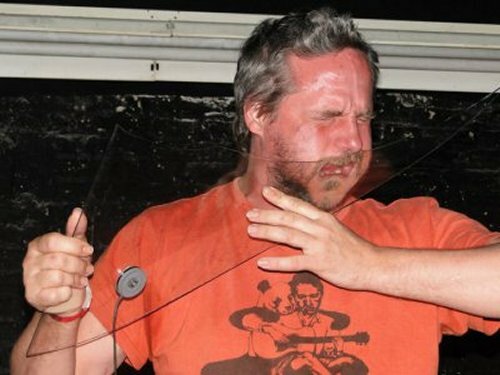 Justice Yeldham brings out the beast in people! I missed the Noveller/unFACT set to get something to eat. I heard the sound person faded them down after a while for the sin of going over their 20 minute allotment. Which brings me to the major complaint of the evening (warning: the rantings of a cranky old man who needs his sleep follow). While some equipment setup problems are inevitable, the schedule of this night in particular just started drifting out of control, in part because a fair number of bands started thinking, "well, this 20 minutes doesn't apply to ME; I've got this audience, and they're loving it. Anchors aweigh!" Thing is, those five and ten minute drifts affect everything — the band in the next room doesn't start until you're finished, and the next one can't start setting up until you're done. Anyway, by this time, I could tell that the megaton finale sets were going to go pretty far into the night once again. And it was a work night, so I got worried. Music of the Sky Islands was Mr. Dolphins Into the Future and Mr. Ducktails, doing something so mellow and blissful, I nearly considered chewing on my own pane of glass for relief. Jason Lescalleet, fresh off a weekend-changing trio with Greg Kelley and Bhob Rainey (aka nmperign) had some trouble getting his rig up and running. After playing a live replication of the side-A track from his new 7-inch, Lescalleet seemed to lose a bit of focus. Loops went on for long periods untouched as he struggled to plug in new re-wirings that would modify the sound. Lescalleet's rig seems to thrive on on-the-fly modification, but here, the rhythm was off. The set grew to a fearsome harsh blast, but the subtlety and detail from the night before appeared in fits and starts. I wanted to like it, and would probably re-evaluate it if I heard a recording, but it was a little rough from where I heard it. 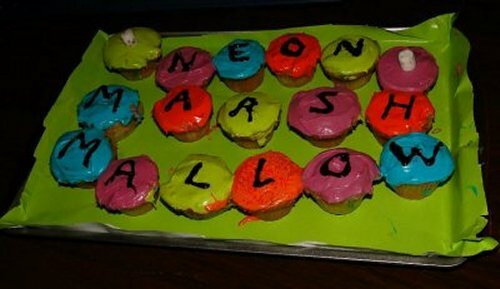 I should hope that the column-feet of descriptions I clattered out should say all that needs to be said about how much I enjoyed the first (and hopefully not only) Neon Marshmallow fest was. The organization of the co-creators, Matt Kimmel and Daniel Smith, and their ability to keep things moving, was beyond laudable. If things got a little behind the last night, that's the nature of the beast. The variety of acts (and the variety of fest-goers the acts appealed to) was sweeping; a little something for everyone, and a lot of different great styles for folks with wide ears. The Viaduct was accommodating as hell, and all the workers and volunteers I interacted with were friendly and patient and hyper-competent. The sound people didn't seem afraid of pushing the systems. The seating/standing hybrid was good for moments when you wanted to rage vs. shows that required sitting. It was an ideal situation, and a world-class festival. Thanks and congrats to all that played, all that hung out and chatted, and all of you for reading this.